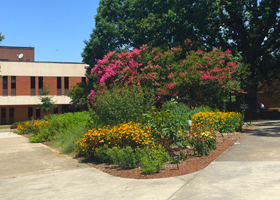 The Sustainable Landscape Demonstration Garden, located in the McGinty Mall or Agriculture Quad, is the result of a campus-wide collaborative effort that brought together multiple departments within the College of Agriculture Forestry and Life Sciences (CAFLS), university landscape services,campus planning, extension, and the SC Botanical Garden. This project was funded by a one-time grant from Public Service and is an example of the creativity and teamwork happening in CAFLS and across campus. Garden research and maintenance is completed by students enrolled in HORT 4080, an interdisciplinary Creative Inquiry course #827. 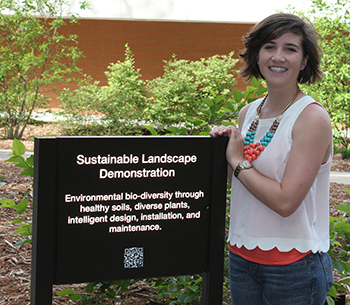 Sustainable landscapes can serve as a model for educational advancement by demonstrating innovative installation, maintenance, and research strategies that seek to instill sustainable environmental stewardship understanding and skills. The McGinty Mall demonstration garden is a contemporary urban adaptation of the traditional ornamental landscape plant field trial. The multiple layers of project participants (researchers, students, consumers, and commercial stakeholders) are intended to build environmental stewardship capacity over time. The garden site (between Barre Hall and Lehotsky) is ideally situated for this type of research due to heavy-foot traffic patterns. 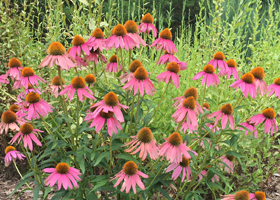 This pilot site will serve as a model for future replicated studies providing quantitative data on the effects of native landscape plantings on human (psychological) and environmental (water and soil preservation) health using interdisciplinary research methodologies. The client, Adrienne Gerus, director of landscape services for Clemson University, specified that the garden should be low-maintenance and visually appealing. Based on these criteria, students in the 2011 fall term HORT 308 class went to work designing the space. Two designs were chosen from the thirteen submitted. 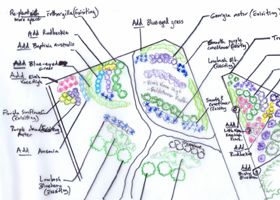 The Lombardo-Fraser design is a rain garden engineered to control and make use of heavy rainfall and stormwater runoff. It uses native plants, many of which are exclusively available at the SC Botanical Garden here in Clemson. The design also includes a footpath through the center of the garden to allow for close viewing and a garden respite. The Reburn design is intended to create much-needed shade through the introduction of native trees such as those commonly found in old growth forests throughout the southeastern United States. The designs were adapted according to plant availability.